Styles of homes vary from person to person, tastes in shows and movies change, but there’s an LG TV for everyone. 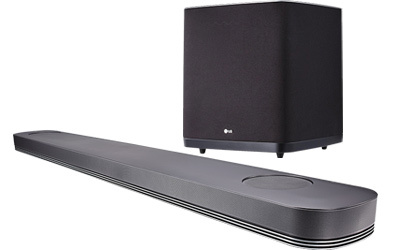 The LG home theater experience. With incredible pictures, theater-quality sound and stunning video, the LG Experience has the latest in TV technology, including the LG OLED and LG SUPER UHD TVs. Plus, find the expert service you're looking for to get the most out of your home theater. LG OLED TV meets artificial intelligence. LG OLED TV with AI (Artificial Intelligence) ThinQ has the Google Assistant built in, making it the center of your smart home. Simply speak into the LG Magic Remote to search for shows, change TV settings, and switch inputs — even ask it to pull up family photos, control lighting, and more.1 It also works with Amazon Alexa devices. 1. Service limited to certain languages. Some features require 3rd party service subscription. LG Magic Remote required and may need to be purchased separately. Google and related marks and logos are trademarks of Google LLC. 2. α9 (Alpha9) Intelligent Processor vary by model. 3. Dolby, Dolby Atmos and the double-D symbol are registered trademarks of Dolby Laboratories. Dolby Vision is a trademark of Dolby Laboratories. The SK10Y home theater sound system with Dolby Atmos brings a host of premium audio refinements, an audiophile-grade speaker design, and Meridian Audio technology for superior bass and voice clarity. LG's PK Series Bluetooth speakers offer up to 22 hours of playback to keep the party going. The speakers are splash-resistant and feature Meridian Audio technology for richer bass and clearer vocals. The UBK90 is the ideal source component for an in-home cinema experience. Supporting 4K Ultra HD disc playback as well as wireless 4K video streaming, this sleek deck is compatible with both next-generation Dolby Vision HDR* and legacy Blu-ray/DVD. * Dolby Vision to be enabled by software update available at a later date. HDR/Dolby Vision compatible TV sold separately and required for Dolby Vision playback. Dolby Vision is a trademark of Dolby Laboratories, Inc.
Ready for a huge picture you can put just about anywhere? LG projectors deliver impressive picture quality, wireless mobile connections, portability and cinematic viewing up to 120 inches. Get ready to supersize your home theater experience.